Sun, February 24, 2019 11:00 A.M. In the early 20th-century Jim Crow South, Parchman Farm—the Mississippi State Penitentiary—was created as a model for inmate labor, which impacted the economy of the state of Mississippi. 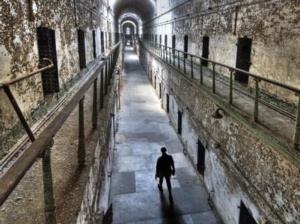 Here in Philadelphia, Eastern State Penitentiary also served as a model prison, founded on a system of strict isolation, silence, and labor. In a special tour, learn about the past and present role of labor in prisons in the United States and the connections between incarceration, industry, and the economy. Visit the historic site’s newest exhibition, Prisons Today: Questions in the Age of Mass Incarceration, and reflect on the social impacts of incarceration today. Discussion will be guided by excerpts from the novel Sing, Unburied, Sing, which follows two generations of a family incarcerated at Parchman Farm Prison. Sing, Unburied, Sing by Jesmyn Ward is the 2019 One Book, One Philadelphia featured selection.